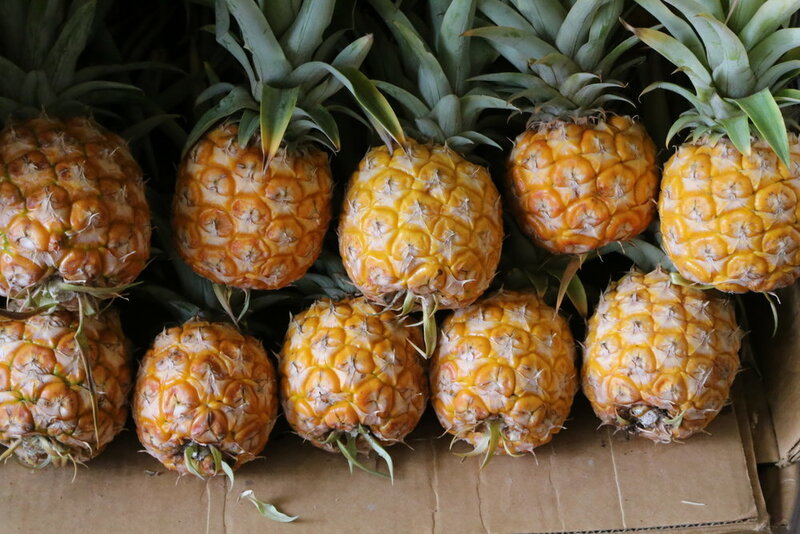 Often when I think of tropical vacations I think of romantic getaways, but Hawaii it turns out is a pretty fantastic place to take your children to. In addition, to the three hour time difference (working in your favor), it isn't more than a hop, skip and a jump to get to Hawaii from Seattle. Last week, we were in desperate need of a get away and ended up booking a last minute flight to Oahu for the week. Since we had been to Oahu before we had already visited all the touristy destinations. It was priceless not feeling the pressure to do much more than eat, sleep, go to the beach, repeat. It felt good to wake up early, go for an early morning run, have a hearty breakfast and then head to the beach until mid afternoon. Often we would look at our clocks and be surprised it was only one or two in the afternoon and we had already accomplished so much in a day. Pair a busy day with an early dinner, sunset beach walk and early bedtime and we were all happy campers. Before having children I would have considered myself a night owl, but now in a perfect world I am in bed and asleep by ten. The fact that the sun sets each night around 7pm made it very easy to convince a tired toddler it is time for bed. My research for this trip consisted mainly of places to eat. We eagerly tried every smoothie place and locally owned restaurant we could within a couple mile radius of our hotel. 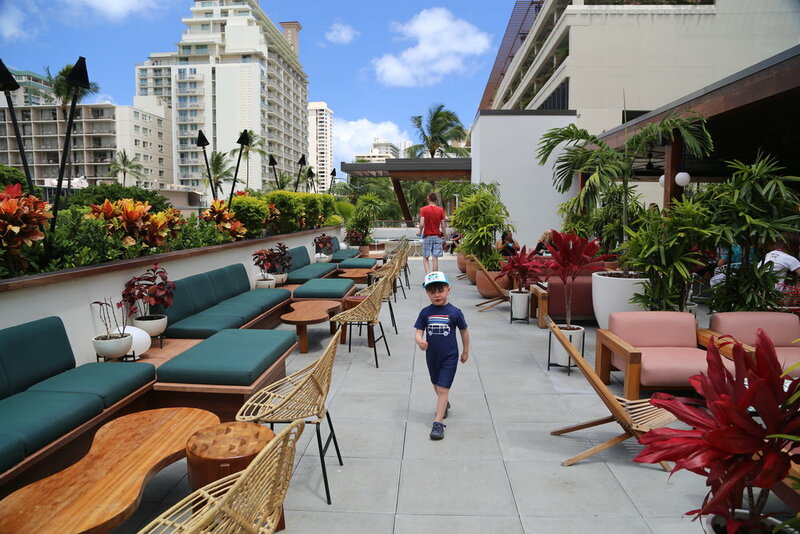 During our visit we stayed at The Laylow Waikiki. 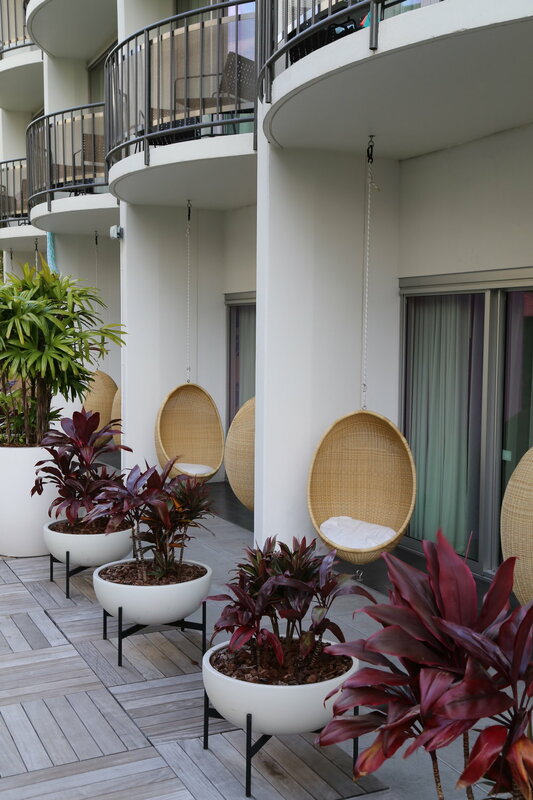 To be honest, I was initially drawn to their interiors and the fact we were able to get a much larger room for less than what the hotels offered along the beach. Since our hotel was not right on the beach, I looked forward to walking the couple blocks to the beach each day. Our central downtown location also meant we were able to try loads of local gems instead of never setting foot off of our hotel's property. Time and time again I always am drawn to boutique hotels. I prefer their overall vibe and how during our stay the staff started to recognize us. 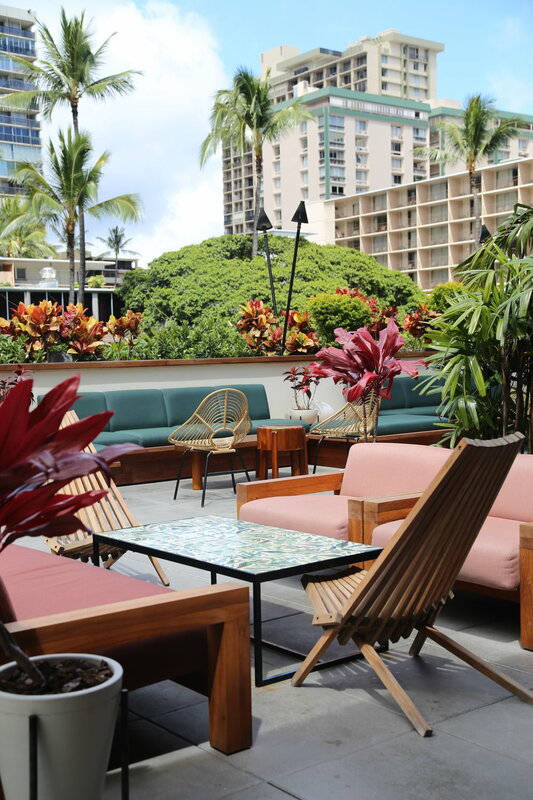 The Laylow also had some amazing outdoor spaces and offered a couple of fun things like daily shaved ice and ukulele lessons for its guests. Traveling with an opinionated toddler is so much more difficult than traveling with a baby. This was the first big trip Jasper really had an opinion about what we did. For those of you interested there were a couple things we did which made our trip a whole lot more enjoyable for him. Plan ahead: Before our trip I bought a new set of beach toys for Jasper. I intended on leaving it at the hotel at the end of our trip, but he had so much fun with it all I ended up bringing it home. Stock up on snacks: If your child is anything like mine than they like to eat (and not necessarily just during meal time). The first morning we were there we went to the grocery store and filled our mini fridge at our hotel with fruits and veggies. Embrace the unpredictable: One morning while waiting for a table at a breakfast place Jasper spotted a farm stand. He promptly ran over and began to grab a bunch of bananas and oranges. While waiting for our table he proceeded to eat two bananas and an orange. Apparently he was hungrier than we realized. 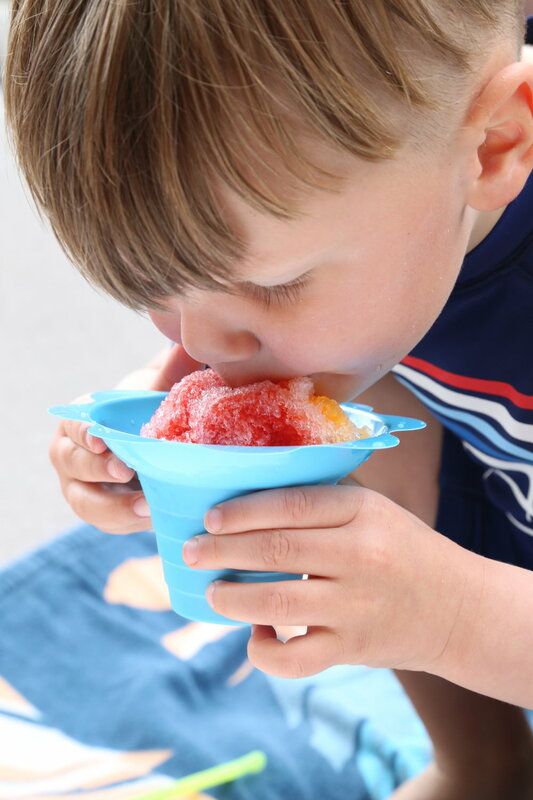 Find out your hotel amenities: Each day at 1pm our hotel offered shaved ice. 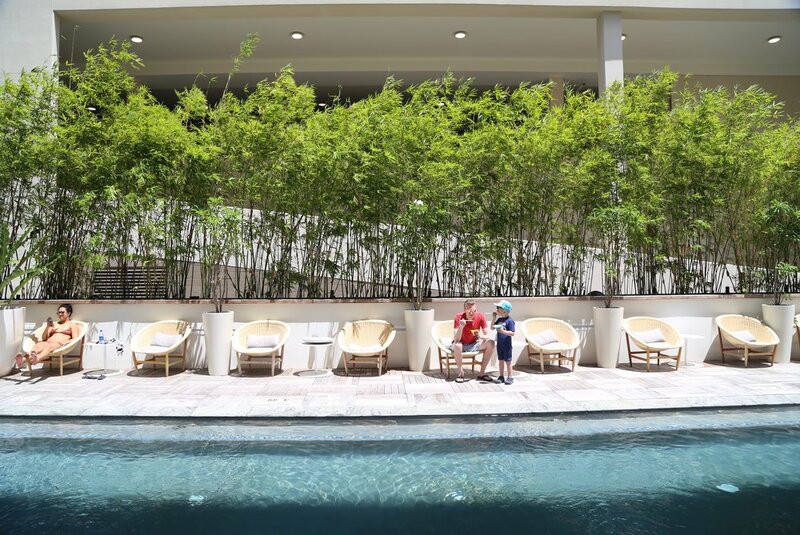 If we timed our day just right we could come back after a busy morning at the beach and cool down with a little shaved ice poolside. Pack light(ish): Whenever we travel far distances we try to limit each person to one small bag/suitcase. This time we knew we wanted to run and walk a lot around the city so we decided to bring our big jogging stroller. It was the perfect thing for Jasper to hitch a ride on when he was tired and also acted as our beach bag/diaper bag/carry all for the trip. It was also nice for Jasper to have something familiar when everything else about our routine was out of whack. Know your limits: We purposely planned a trip which required very little of us once we arrived. When we took Jasper to Iceland and Norway it consisted of six flights, countless hours in the car and ultimately a little too much traveling. Now Jasper is no longer content to ride for hours a day in the car and we would rather spend those precious moments running around at the beach than sitting in traffic. Ultimately, we made the decision to not rent a car for this trip and instead rented a car for just one day to further explore the island. Although we did not have time to do everything on our list it really ended up being the best of both worlds for our family. Make early dinner reservations. I really enjoy eating an early dinner. Being able to snag one of the first seating assignments at a top notch restaurant really takes the pressure off of us when dinner time rolls around. We know when and where we are going to eat, we know there will be no waiting in line and we usually have most of restaurant to ourselves. Know what your child likes and plan activities around that. When we are at home we spend a lot of time at the beach, hiking and being outside. When we are on vacation we spend a lot of time doing those same type of activities. We are all in our comfort zones and feel at ease and content just doing our thing. Know what works. I know many people report about the dangers of incentivizing with food (eating disorders, food issues etc), but for Jasper knowing he can have a "treat" after an activity like behaving himself during dinner out is usually good motivation for him. When all else fails head to the beach. Water is such a grounding force in our life. We all get such pleasure out of being near the water. When we felt tired or cranky or both a little time at the beach made us all happy again. Give them space and know their happy place. I don not believe in helicopter parenting. As long as Jasper is not hurting himself or others I like to give him space to explore and discover. I find it very important for both Jasper's sanity and ours to give Jasper supervised alone time when we are all together day in and day out. Walking gives you a new perspective. Sure we could have Ubered or easily taken a taxi everywhere, but we would have missed out on so many sights and sounds of the city. I think it is important in this fast paced world we live in to slow down and enjoy the journey as much as the destination itself. Don't put off vacations until your children are grown. Sure it would have been be easier to leave Jasper at home and take a vacation just the two of us. However, we would not be giving Jasper the important gift of a global perspective. It is one thing to know of other cultures but having experienced them first hand is priceless. Even though Hawaii is part of the United States there is a laid back vibe and openness to others which is very foreign in most American cities. I am grateful to have the time, energy and excitement to show Jasper the world one place at a time. As we flew home I am already dreaming about our next adventure together.